Ha Giang and Ba Be Lake are a good combination for this mountain loop driving trip. The features of the two destionations are very different: Different colors, different activities, different people... This 5-day trip is a great experience for those who love getting off the beaten track to visit beautiful landscape and learn the authentic culture of local people in Northern Vietnam. Accommodation is expected to be basic but the top of the areas will be used for your best confort possible. Food is very local, too. There is no western food to expect except bread, fried eggs for breakfast at some places. Meals are at local food stores but we always choose the most acceptable one. Depart from Hanoi at 7.00 AM, our drive to Ha Giang occupied most of the day. Having lunch on the way. Arrive at a hotel in Ha Giang City, check in and rest for the remainder of the day. 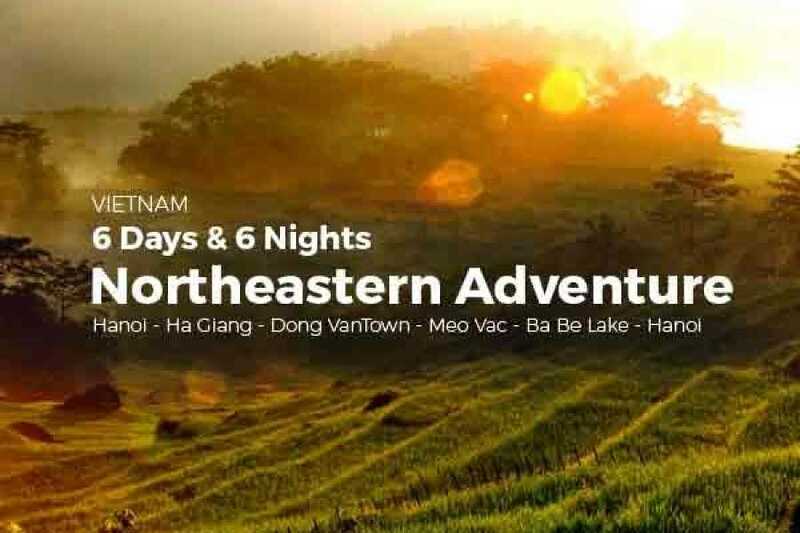 Dinner and overnight in Ha Giang City. After having breakfast, we set out for the morning drive up to the highland region of Ha Giang. The scenery is getting more stunning with high passes and august mountains. The typical photo opportunities are at Quan Ba pass and Quan Ba Heaven Gate with some steps to a view point atop a hill. Have lunch break at Yen Minh town. The afternoon drive is amazing, the driver will do his best for you to stop as often as possible for you to admire the scenery and taking photographs on the way as you are traveling thru' the Karst Geo-park. Dong Van Karst Plateau is unique combination between Geoheritages and cutural heritages. Up to 80% of the karst formations of Dong Van Plateau are limestone formed by environment conditions and different development stages of nature. The scenery is amazing and the local life and the culture of the hill tribes such as the H'mong is something that will be very memorable for your trip. One of the typical stops is the residence of the Vuong family, still called “Palace of Hmong King”. Arrive at Dong Van Town, check in your hotel and relax for the remainder of the day. Dinner and overnight at Dong van. This morning, we will embark on a moderate hike to the rocky mountains on backroads which leads us to some hill tribe villages which is situated in between the grey rocks. After the morning hike, we get back to Dong Van town for lunch. In the afternoon, we will drive over the massive Me Pi Leng Pass to Meo Vac. Have a break on the pass to admire the panorama over the huge abyss which is bottomed by the Nho Que River. Arrive at Meo Vac town, check in the hotel, dinner and overnight in Meo Vac. Today we will spend the whole day driving downhill to Ba Be National Park. The topography is changing from the rocky plataeu to soil mountain with green vegetation and forests. Lunch one the way at a local food store. Arrive at Ba Be national park, check in your accommodation either at a homestay near the lake or at a guesthouse of the park's center. Dinner and overnihgt at Ba be. Following breakfast, it is a short drive to Ba Be Lake where your private boat will be waiting. Cruise to Puong Cave, which is a massive 30 meters high. The cave is an impressive feature of the area and if you are lucky you can see some of the local inhabitant bats. ***Optional program on 4th, 9th, 14th, 19th, 24th & 29th days of the Lunar Calendar: start early in the morning and take the boat to discover Ban Tau Market which is 1 km (20 minutes walk) from Puong Cave (confirm this with tour operator before your departure as arrangements have to be made). Following the visit to Puong Cave continue down the opposite end of Ba Be Lake to Dau Dang, here there are a series of spectacular cascading falls between sheer walls of rock. After visiting the falls head back to your guesthouse, the rest of the evening is at your leisure.